Q: What is the point of bleeping out the Bride's name? Q: Is 'Kill Bill: Vol. 1' based on a book? Q: Why is the bride allowed to carry her sword with her on the plane? Tarantino's Blue Period is OVER! 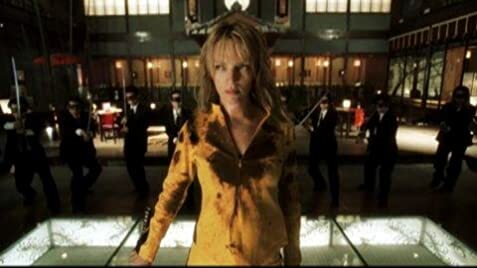 Just saw Kill Bill: Vol. 1 and was surprised, to be honest, at how incredibly GOOD this film is. Here is a craftsman (or artist, if you prefer) at the top of his game. 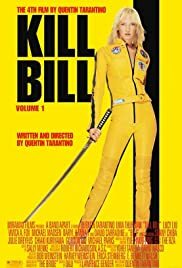 Some of the shots are simply incredible; the score is, for the most part, vintage Tarantino selections- and the RZA does a very good job at filling the blanks; Uma Thurman is a great female lead, for sheer presence (and decent acting chops). Even Lucy Liu, who I expected was going to re-hash her Charlie's Angel character, burst on the scene like a flaming nunchuck. The stringing together of the scenes was impeccable. The transitions, the intercutting between dialogue, the flashbacks... I simply could not get enough. Tarantino IS, indeed, having fun here. He is giving us a film that may not go down as a classic, Pulp Fiction style, but that shows us what is yet to come. 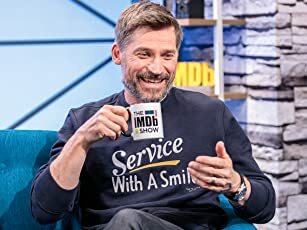 I doubt that he's lost his writing talents (as some have claimed), and I actually disagree that the dialogue in the film is "poor", or that there are "no memorable lines" (Empire). The kung-fu genre has never been a particularly good park to display Shakespearean writing virtuosisms. The lines work fine. 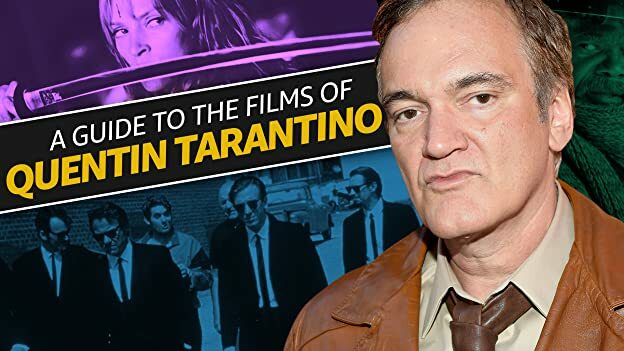 The plot is simple enough, but Tarantino takes a burger and serves it as "steak tartare with sauce au poivre and asparagus terrine". He basically manages to cram so much information into the film that plot is simply irrelevent. What is relevent is the Bride's thirst for blood, her primal sense of vengeance and our total devotion to her. Bill, of course, is one of the greatest characters to ever NOT appear on screen. Overall, a great movie and an example of how a filmmaker's tool is not his pen: it's his eye.